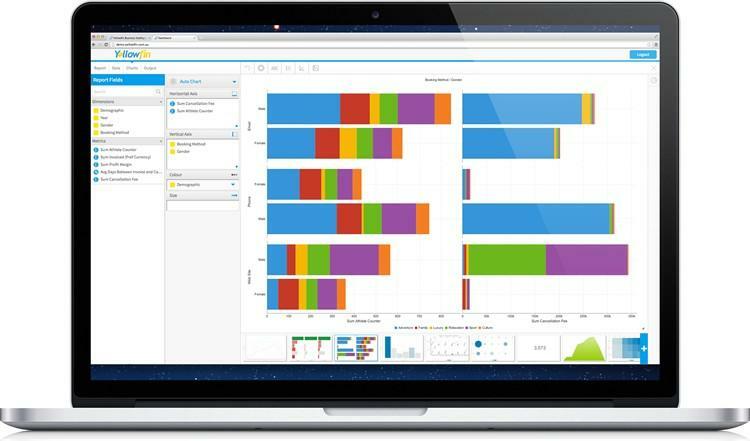 Global Business Intelligence (BI) and analytics software vendor, Yellowfin, has furthered its ability to support self-service BI and independent Data Discovery with a series of important data visualization enhancements. The enrichment of Yellowfin’s data visualization capabilities was included within the latest version of its BI platform, Yellowfin 7.1. Yellowfin 7.1 extends the Auto Chart functionality launched in Yellowfin 7, with 16 new chart types now supported by Yellowfin’s Auto Chart feature – including combination charts as well as maps. As a result, Auto Chart now supports over 50 best practice chart types and combinations. Increasing the breadth of visualizations supported by Yellowfin’s Auto Chart feature offers further assistance to non-technical business-users, enabling self-service content creation and independent Data Discovery. The use of color options within Auto Charts has also been improved dramatically in Yellowfin 7.1. Users can easily apply conditional formatting on an Auto Chart, within the Chart Builder, to create color-coding across dimensions or metrics. In Yellowfin 7.1, users have the ability to toggle between Yellowfin’s Auto Chart option and manual chart selection, without affecting settings and fields, adding a greater level of flexibility when building visualizations. “Business users can still enjoy the guided support offered by Auto Charts, while more adept users – with a predefined idea of the style of chart they want to create – can simply toggle to manually create specific visualizations,” said Rabie. For basic charts in ‘auto’ mode, users can now also seamlessly swap back and forth between chart types without having to rebuild content. Yellowfin’s output canvas, introduced as part of Yellowfin 7’s overhauled Report Builder, enabled users to drag-and-drop multiple charts onto a single space and arrange them side-by-side to produce multi-chart reports – a miniature dashboard type experience for data consumers. This new feature allowed users to resize the charts, the canvas itself – and add a range of custom widgets (text, images, icons, etc) to the output canvas – to create a customized view of visualizations and add context to multi-chart reports. “Yellowfin 7.1 adds to this experience by allowing users to also create bespoke Big Number charts within the output canvas,” said Rabie. “This change empowers users to build customized summary charts within a multi-chart report, using the range of available font types within Yellowfin.